Dress-c/o Hallelu, Jacket-Old Abercrombie & Fitch, Shoes-Steve Madden (similar pair), Handbag-c/o Foley and Corina, Watch-Michael Kors (similar here), Bracelets&Rings-H&M, Necklace-c/o EmersonMade , Fingernails-Essie "Lapiz of Luxury"
This weekend the warm weather was the perfect excuse for a day of shopping and wine tasting with girlfriends. We met at Santana Row --an outdoor shopping, dinning, and entertainment complex in the Bay Area. Its European vibe makes it the perfect place to sip wine and and hang with friends. I wore my new dress from Hallelu and paired it with fun complimentary colors. My girlfriend had the same idea and came with the matching Foley and Corina handbag! Too cute. Such a fun dress and I love how you paired it with your bag and shoes!!! Love the dress!! All these bright colors make great outfit! I love this fun cutout dress, but those bright bracelets are absolutely to DIE for! Gorgeous dress, love the close up pics of the details. Great outfit! Isn't it wonderful to wear all the bright colors?!!? That Foley and Corina bag is super cute and such a fantastic color. Adore your new dress, too! You look beautiful, the dress is amazing!! cute how your toenails match your bag! i love this bright outfit. This is such a gorgeous look, I love all the colour. That dress fits you so perfectly and has the most lovely print. This dress is so fun and I love the floral print. Also admiring the backdrop for the images, it's perfect! love the juxtaposition of the blue & teal! sounds like the perfect night for all the fun colors! that purse is awesome and i really love those platforms! I love the bright colors here! The nails, dress and accessories are all fabulous! I think you might be able to pull off having a blog purely about bags. I always love your choice in bags and this one is no exception. I have been eyeing this little number for a while now. Looking terrific as usual! I'm totally smitten with the color combo here! It's truly just gorgeous, and SO perfect for Spring. I actually have my own city tote by F&C in black, but after seeing you with this green one, I'm definitely considering picking up a second one. Love all those glorious colors! Wish I could steal some of that sunshine! I love all of the color in this post!! Perfect for Spring!! XO. Thanks ladies! I've really been having fun with colors! Love, love, love all the color! Yea spring! Very nice and bright. You look great! Amazing post! I love how SF has so many facets. It must be the perfect place to do shoots like this. You look amazing and the lighting and composition is incredible. What a pretty outfit! I love all the bright colors. I need some more of those in my life. Love all the bright spring colors Taylor! The cut-out dress is so special and that purse is the perfect accessory! Great polish color on the toes! I miss Santana Row! Need to venture down there soon... and I love that you both have the same bright green F+C bag!! Alicia-- we need a date with Lisa and Caitlin there before you move! I love my F&C bags so much; the leather is tdf. That color is gorgeous! Oh wow..! Lovely dress!! ..adore floral print dresses..
you have an awesome blog! Enter a chance to win a pair of pretty lace earrings! Adorable. 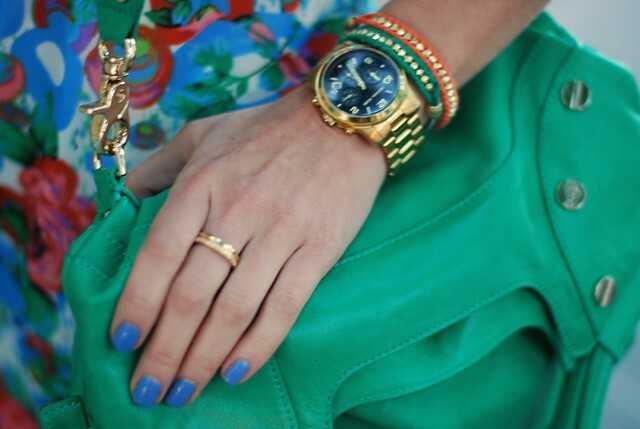 Love the bright bag and nails and floral goodness. Great shooting background too. The dress is very beautiful ! Love the blue nail color! By the way, check out my Uniquely Your City blog post share! I would love for you to have your own post on there! Not sure if you ever post about things to do in your city, but sometimes that coincides with fashion posts - even events would work. Loving that dress. Hair looks great as always. Gorgeous. Lapis of Luxury has been my favorite nail color lately! I love all the color! Beautiful dress and bag!! Oh, super random, but I think I met you at the R29 launch party (w/ Monica and Chin)? This is my first time stumbling onto your blog - looking forward to reading your posts! gorgeous! I love when my nails match an outfit... it just makes you feel so good, right? and that bag and those shoes are fab. you look beautiful as always. This look is so fresh! Love it. 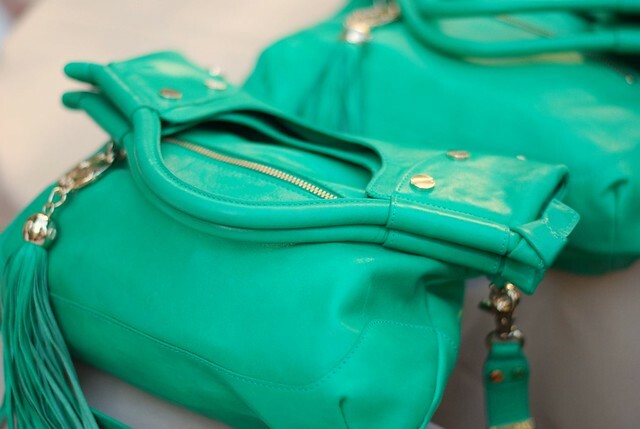 You have really made that bag a staple..who says bright green isn't the new camel bag for spring? Loving the lil cut out deets on that dress. love the chunky gold watch! Ah we have such similar taste! I tried this dress on at Hallelu but they didn't have my size. It looks great on you. I love the colour combination here and the primaries with the pattern.